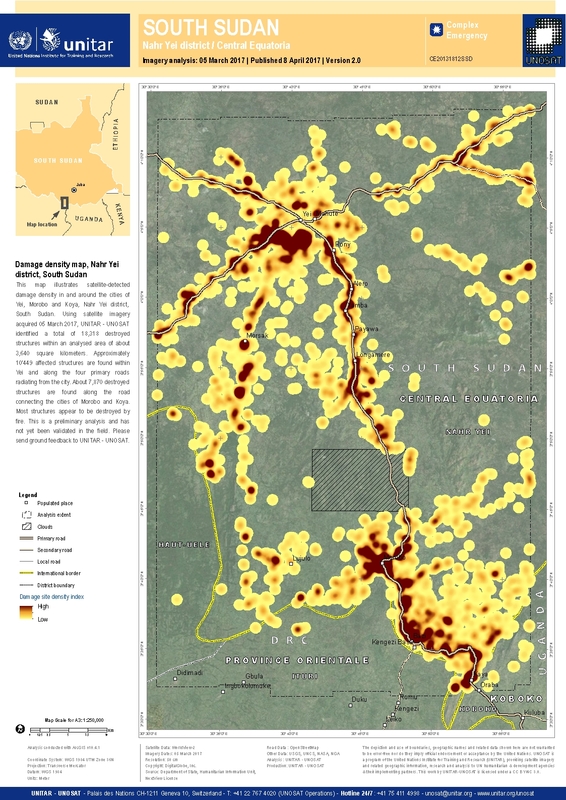 This map illustrates satellite-detected damage density in and around the cities of Yei, Morobo and Koya, Nahr Yei district, South Sudan. Using satellite imagery acquired 05 March 2017, UNITAR - UNOSAT identified a total of 18,318 destroyed structures within an analysed area of about 3,640 square kilometers. Approximately 10'449 affected structures are found within Yei and along the four primary roads radiating from the city. About 7,870 destroyed structures are found along the road connecting the cities of Morobo and Koya. Most structures appear to be destroyed by fire. This is a preliminary analysis and has not yet been validated in the field. Please send ground feedback to UNITAR - UNOSAT.